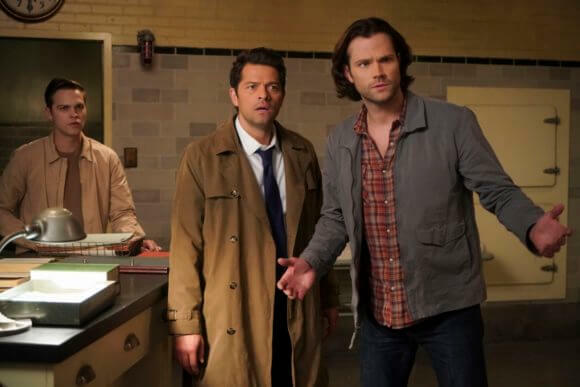 Supernatural Season 14 Episode 14 Recap: "Ouroboros"
The CW’s Supernatural has given us reason after reason why cutting back from 23 episodes to 20 in season 14 was well worth it. After another hiatus, “Ouroboros” exploded the show back onto our screens by delivering an outright resolution to the season arc; with six episodes still ready to air. What started out looking like a filler episode – a trademark in the 23-episode era – ended up with a final battle with the main antagonist. Season 14 episode 14 began with a callback to the horror elements to the show, which were a mainstay in the earlier seasons, as a man devours a poor victim; this complete with cooking the man’s organs and then swallowing his eyeball. The eyeball wasn’t just for his taste buds though, as he instantly saw Sam (Jared Padalecki) and Dean (Jensen Ackles) sneak into the house in pursuit. The man then calmly leaves with his pet snake, and the boys sneak into the house in pursuit – yes, that just happened again. The boys happen upon the remains of the eyes-less victim, and are shown to be accompanied by Castiel (Misha Collins), Jack (Alexander Calvert), and Rowena (Ruth Connell) of all people – the scene gave off vibes of a fantasy police procedural, which now that you think about, would be an awesome spin-off for the show. The group discusses how this is the sixth case in New Mexico, and Rowena points out there’s a meaning behind the victim’s black lips. She and Sam then engage in Sam’s favorite activity: Research. 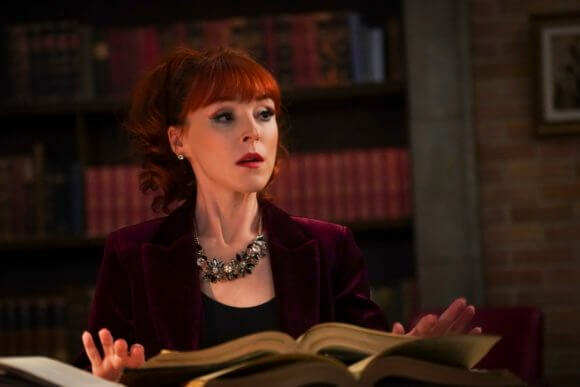 By now, it appears Rowena isn’t just an occasional ally anymore, and she tries to get Sam to confide in her how they rescued Jack from death and how Dean’s been holding an archangel in his noggin. Sam isn’t in the mood to discuss it, and brushes the matter off. Meanwhile, Cas and Dean talk over coffee about Dean’s struggle against Michael – he hasn’t been sleeping now that Michael’s been looking for moments where he can catch Dean off-guard. In the bathroom, Jack coughs up blood; he’d earlier told everyone he was fine, but heals his throat with magic, which isn’t a good thing because you’ll remember using his powers means Jack’s soul burns off. Being the undisputed champion of research, Sammy and Rowena figure out that the monster is a gorgon – not the Clash of the Titans style Dean was hoping for, but an ancient demigod. In what Dean calls “an A.V. Club presentation,” Sam and Rowena conclude that the gorgon can see the future when it consumes an eyeball. This makes planning against it impossible as the gorgon can simply see what’s going to happen before it happens. In the next crime scene, where the gorgon takes out a trucker he’d pretended to seduce, Dean finds a note from the gorgon for him, asking Dean to back off or he, the tall guy and the red-head would be killed. The note explicitly leaves out Cas and Jack, despite the fact the gorgon saw this moment in the past, which means his powers don’t allow him to perceive angels or close-enough-angels like Jack. Rowena advises to get an antidote running for the gorgon’s poison, and she, Sam, and Jack head off to the vet to acquire some. The plan sees little Jackie boy being turned into a puppy by Auntie Rowena so he can infiltrate into the medicine cabinet. But first, Sam and Rowena pull off a wildly accurate depiction of a bickering couple who don’t know what to do with their newly adopted puppy (and now all we can think about is how good Sam and Rowena would be if they were a canonical couple). Maggie – yes, that chirpily annoying girl who Lucifer had killed and resurrected last season – calls Sam from the bunker with gorgon-killing info, which turns out to be a simple sliver blade slice to the neck. As is the norm now, Castiel gets beaten by yet another villain-of-the-week and is infected by the gorgon’s venom, while Jack is also knocked out. Remember, these two were the only ones the gorgon couldn’t see in his vision of the future, which is why they ambushed him. Sam and Dean’s intervention does nothing to make matters better, and Dean is severely injured by the gorgon, who repeatedly pounds Dean’s head into a wall. Jack manages to surprise the gorgon and decapitate him, and cures Castiel by using his magic, after the antidote didn’t work on him. Dean is rushed back to the bunker (how the heck did they get him there so fast? ), and is still under because Castiel can’t heal him; causing Cas such emotional stress that Misha Collins’ voice seeps through for a few seconds instead. Castiel, who plays the role of the wise, straight-man in this episode, imparts some more sage advice to Jack by reminding him that Dean and Sam are still human, although they are extraordinary, they will still die one day and leave Jack behind. Jack doesn’t understand Cas’ point that it means he should appreciate the time he has with his two human fathers rather than wallow over how he could save them. Jack’s still adamant he wants to use his powers to heal Dean when the man’s voice erupts from behind them. Dean’s awake and frantically searching around for someone: Michael’s gone from within him. Before he can go on classic Dean tirade, the sounds of multiple dying screams attract the heroes to the main part of the bunker where every hunter from Sam’s set-up of the Apocalypse World survivors are shown to be slaughtered. Maggie races to Sam’s arms, only for her to be smote from afar. Michael’s here, and he’s wearing Rowena as his meatsuit. In a flashback, Michael is shown to have entered Rowena’s mind to threaten her with death lest she consent to his possession. She counters that only Sam can kill her, as revealed in a season 13 episode, and shows no fear. Michael counters that he’ll just kill her friends, whom she truly has come to care for, leading to Rowena’s consent. Michael, never a man to honor deals, displays more of his awesome powers by cutting off Dean, Cas, and Sam’s breathing. He then turns them blind and then begins destroying their insides. Jack is pushed too far and uses his powers to send energy blasts at Michael, whose own blasts prove ineffective. Jack, proclaiming himself both the son of Lucifer and a Winchester, expels Michael from Rowena, and then proceeds to destroy Michael’s essence, only leaving his grace which Jack then ingests; it was kind of like angelic cannibalism. The episode abruptly ends with a smiling Jack telling his bewildered friends that Michael is dead and he’s fully healed, revealing angel wings and his original glowing eyes. With six entire episodes still to go, this is the first time that Supernatural has ever had its current arc concluded. This can only be a bad thing because it either means Michael isn’t truly dead, or an established character will be taking the reins as the main villain – remember Lucifer stirring in the empty and Nick’s pursuit for him? It also appears Jack might not be as innocent as he once was after he displayed his disillusion with how the world and life worked. Everything seemed meaningless to him, which is what Lucifer had once said. The episode was a solid outing for Supernatural as it avoided what would definitely have been a filler episode last season, and instead patched up the main storyline instead. This leaves the remainder episodes with the task of surprising us greatly; both a tall and easy task as it’ll take something big to overcome the end of Michael, but by this point just about anything will surprise us.